Akhu aka Ronid Chingangbam is a vocal & guitarist of the Alternative Folk Band Imphal Talkies based at Delhi/Imphal. Club Muzik: Q1. Is music your only career? Why do you take it up? AKHU - As of now I am doing only music. By profession I was a Physicist. I am taking a break from it at the moment. Club Muzik: Q2. How do you want to be in a different version of yourself? AKHU - I can't imagine myself doing anything else or thinking of another version of me which I am not really is a waste of time. Club Muzik:Q3. Any plans to work or be part of the Manipuri movie industry? Tell us, what you would look for if you are looking forward to any of such? AKHU - No thoughts so far. Time will tell. Club Muzik: Q4. The fans are the one that keeps an artist happy most. How do you want to portray yourself to your fans keeping aside social meanings? AKHU - Fans are fans as long as you do good work they will like you. Club Muzik: Q5. Share us the social meaning of your works in music? AKHU - My works come up from a very personal experience and how I see the things around me. It might be political or apolitical. But isn't any form of art about what we around and how we feel about lives we live? Club Muzik: Q6. Is it true that people cheer more of your lyrics rather than the music in your songs? AKHU - Yes! that's true. I am more of a poet than a singer. Club Muzik: Q7. Some studio tips you would like to share to get the best sound results? AKHU- Get yourself a nice system and record your own music and get it mastered with a good engineer. These are the days of Do It yourself. I am still struggling with my own recording. Club Muzik: Q8. What is the difference between Imphal Talkies and Akhu Chingangbam? 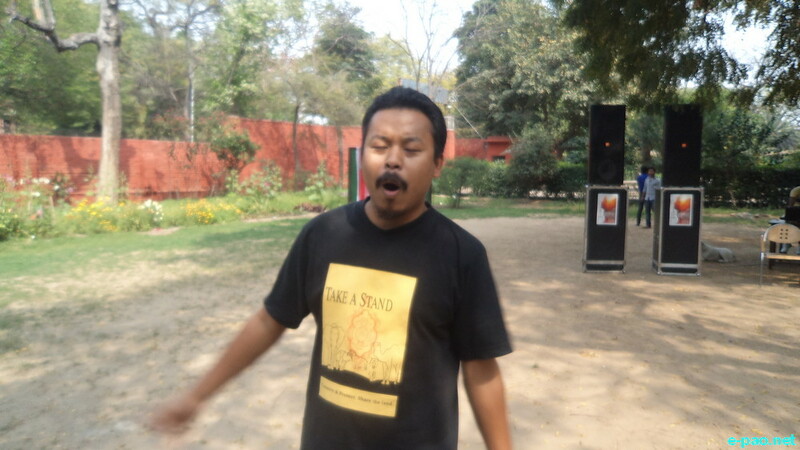 AKHU – Akhu Chingangbam is more of a performer, that's how it started way back in Delhi in 2007 and 2008. When I recorded my songs with my bandmates then we are Imphal talkies. There is certain freedom in doing solo shows which I really enjoy. But for last two years since I am based in Imphal we have been doing as the band. Club Muzik: Q9. Why do you choose guitar in particular apart from other global or traditional instruments? AKHU- I use Pena in lot of my recordings. Though what you can do with a guitar is actually unlimited. It can mimic any sound. But I am just a simple guitar chord strummer. Club Muzik: Q10. What are the things an artist should look forward to have a great fan following? AKHU - I think one need to be honest about what he writes and sings. Club Muzik: Q11. Share us some of the meanings and perception you came across in organizing and be a part of "Where have all the flowers gone" event? AKHU - Late Pete Seeger is a protest folk singer I have been admiring since I got to listen to him. With frens we thought we should organise a gig remembering him and his legacy. He was also an environmental activist. He loved nature. And it is high time we too care about our environment. Look at Naga River, Nambul River, they are filled with plastic bottles and garbage. And the government is trying to cover it up with their silly cemented stone slabs. The dirt is going nowhere unless we care to clean. In the event around 400 students came up for the environment related painting competition. We cleaned the entire venue which is a beautiful hillock. It was filled with syringes, broken bottles, plastics, etc. We had Susmit Bose to headline the event who was a fren of Pete Seeger. It was a hard task for the organisers but enjoyable . And it is happening again next year with more artists from outside the state. Club Muzik: Q12. Tell us about the Akhu that most people don't know? AKHU - I am coming up with a haiku book with a dear friend and brother named Kapil Arambam. He is also the one who designs my logos and any designs which have to do with Imphal Talkies. I am excited about it. Club Muzik: Q13. Any crush on a girl/lady yet....or already set? This article was posted on September 07 2014.